Sojourner Truth Parsons, Heartbeats Accelerating, 2016, acrylic on canvas, 84 x 60”. Strawberry-flavored Dippin’ Dots, Sobranie Slims, Himalayan salt lamps, the ombré hem of Gwen Stefani’s wedding dress, the drunk tank at Santa Clara County, carnations on Mother’s Day, orchids, a love stone, Cam’ron in mink, Sissy Spacek as Pinky in 3 Women (1977), a Juicy Couture velour tracksuit, a Jem doll’s hair, Bazooka gum, an inflatable flamingo, Pucci lingerie from the 1960s, Wet n Wild 901B in a black plastic tube: These are the shadings of pink in Sojourner Truth Parsons’s new paintings that involve, variously, a Dalmatian, flowers, cigarettes, acrylic nails, and a temporary tattoo dispenser’s worth of butterflies. Many of these works seem to be of the artist’s best friend, Julia, whose face is never seen. She’s always turned around—perhaps blushing. Hung large in the narrow rooms of this Lower East Side gallery, the five canvases on view are done in a real naïf style that owes a few things, directly or indirectly, to the Royal Art Lodge of fin-de-siècle Winnipeg. 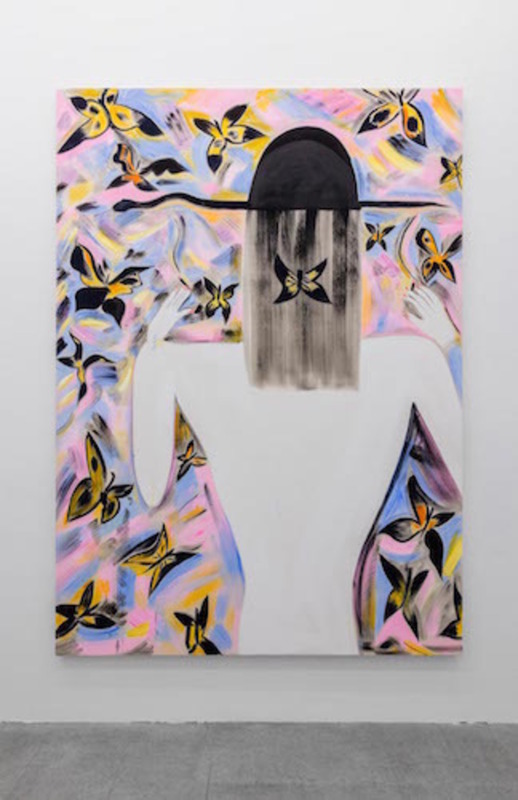 Outside Canada, where Parsons grew up and went to art school, the trend is obtained from the works and ethos of Paul Klee, or of Albert Oehlen, and it too often manifests, among newer painters, as badness, for a simple lack—or premature refusal—of taste. Parsons is better than that. And sweeter. Hers are no Sunday paintings, but paintings in which every day is Sunday, with a Sunday’s sense that a private self must be indulged. Hence the delicate pleasures here, the coordinated languor, and the attendant deep blues.